(Disponible en Français) D’Auchel, The Hong Kong Ladies Paradise. 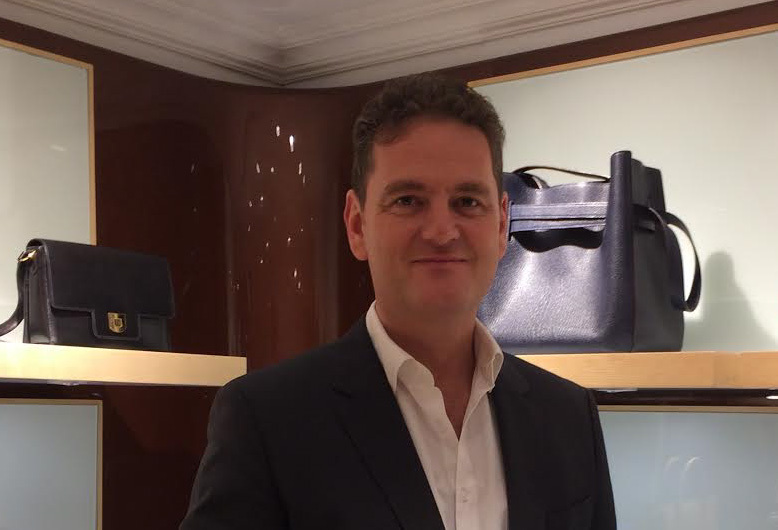 While wishing “to promote the best of the French craftsmanship abroad,” Olivier Dauchez managed to create a luxury brand, which distinguishes itself from all the others. This performance is a feat at the Fragrant Harbour, where most of the luxury companies of the world chose to settle down and are engaged in fierce competition. 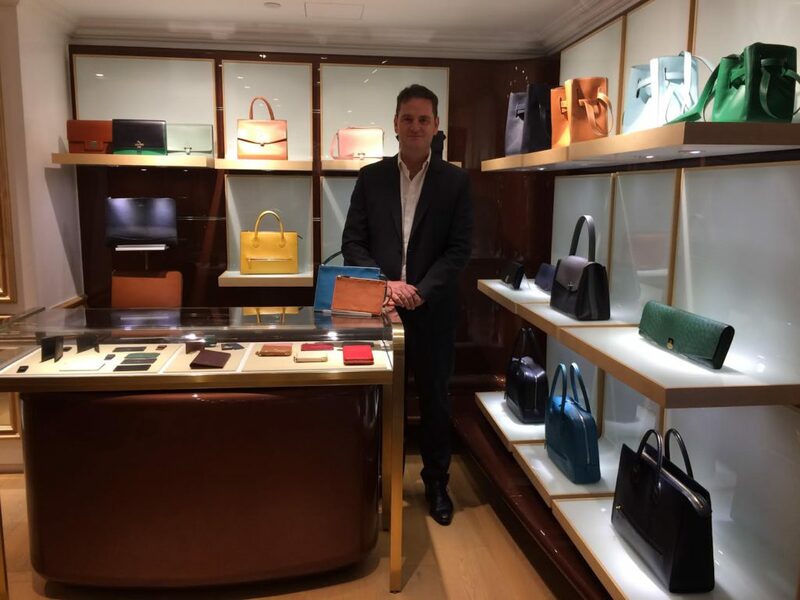 The magic of D’Auchel operates as soon as the visitor enters the flagship store and workshop dedicated to the leather goods, located at Lyndhurst Terrace (Hong Kong Central District), opened in July, 2015. The elegance in all shapes, the genteel highlighting of the diverse collections without falling into ostentatious are playing a role in this delight. There is an air of nobility in this smart cocoon and it is no coincidence. A clue, the brand logo represents the 13th century coat of arms of the family D’Auchel, whose Olivier Dauchez descended from. He even lived his childhood in the castle of his mother, the Castle of Villechaize in the Loire. The enchantment increases with the touch of the leathers, with the discovery of the finishes’ delicacy and of the sewings’ finesse. The amateurs know it straight away: The quality is superior. « We import all our materials from France, the threads, the leathers from the best tanneries. And everything is hand made, » confirms Olivier Dauchez. It is all the easier to verify, as the workshop is integrated into the store. Its visitors are able to contemplate the meticulous cutting work, the assembly and the making while discussing with the artisans. This privilege also is a luxury because both artisans chosen by the brand creator are among the best in all of France. 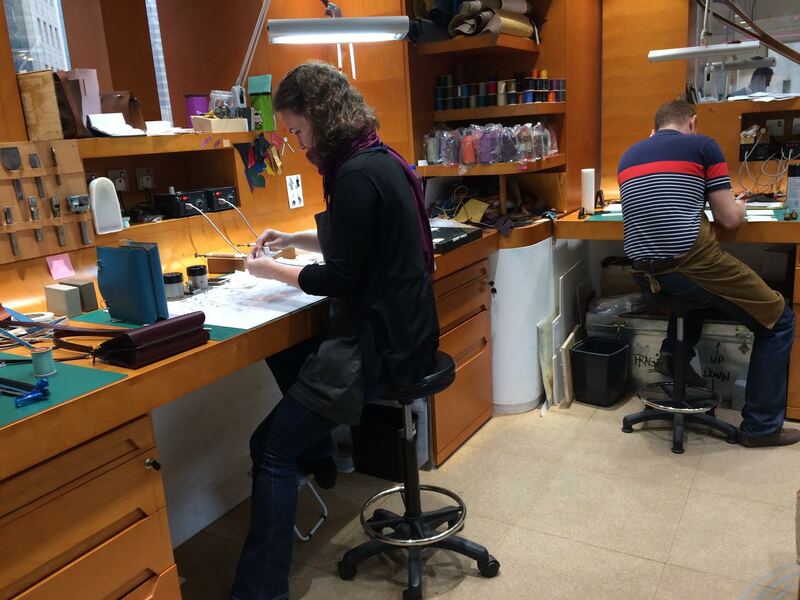 “Compagnon du Tour de France” *, the leather master craftsmen have a 10 to 15 years of practice at French high-end ateliers. It is the first time that « their skills are showcased to clients in Asia, » tells the entrepreneur, also a passionate and a deep expert in all aspects of leather goods.« During more than twenty years, I led a factory which manufactured bags for the established luxury brands. Then, I wanted to reconnect with the quality in its pure form. I wished to rediscover the craftsman authentic techniques, then to expose them abroad, » explains Olivier Dauchez. Every D’Auchel bag, which requires at least two weeks’ work, is unique. It is entirely tailor-made. The customers choose the leathers, their colors, the size of the shoulder strap, of the computer pockets, of the organizers, etc. On top of that, “we are able to offer hot stamping initials. We know how to design personalized molds (kept at the store) for more sophisticated writings, » specifies the brand inventor. Nevertheless, the originality of the D’Auchel concept goes beyond that stage. The customers are invited to view and even to participate in the various stages of their bag creation. As such, a relationship of complicity with the experimented artisans emerges from the regurlar visit at the workshop. « By learning the thoroughness and the meticulousness of the work of the leather, our customers live a unique experience. They appreciate all the more the good they have ordered, » comments on Olivier Dauchez.This experience, a way of inspiring loyalty, is an overwhelming success. It fulfills the expectations of the Hong-Kong wealthy women, who « already have the handbags of all the worldwide luxury brands. Now, they are in search of an exclusive good, totally customized and adapted to their personality, » notes Olivier Dauchez. 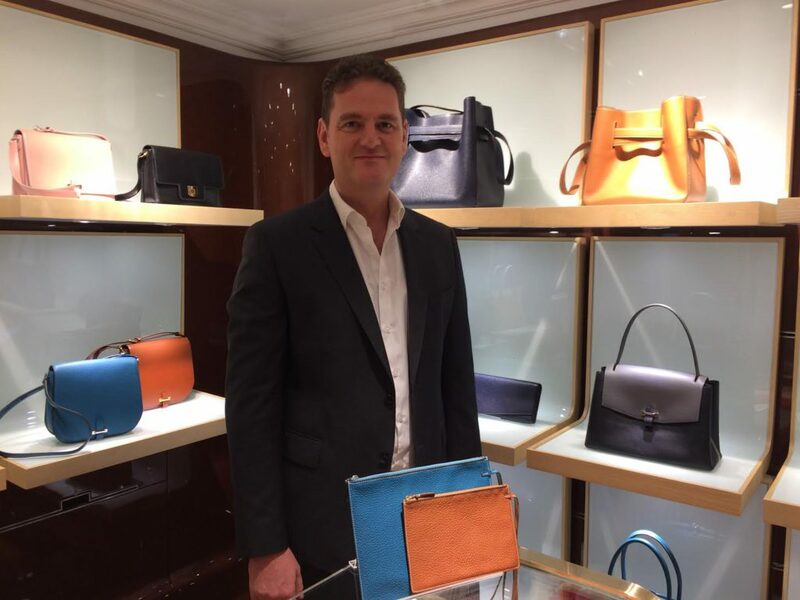 At the moment, the clientele of D’Auchel, made up of residents of the Fragrant Harbour at 80%, is mainly feminine, even if the house knows also how to design wallets, card holders, briefcases for the men. The Lyndhurst Terrace visitors target the evening or the daily handbags, like, for example, the “Lena”, which is coquettishly reversible. Or, the “Thaïs”, that changes shape according to the mood, depending on the belt adjustment. What is the meaning of the bag ranges’ names? Olivier Dauchez answers: « Each took the name of a member of my family. » The latest is Théo, under the sign of travel. This young boy, who looks like the « Little Prince », is a character whose diverse stopovers are drawn (thanks to a hot stamping) on the models chosen by the customers. Now that the image of the first D’Auchel store is associated with the Haute Couture, what are the founder ambitions? « We hope to open a shop on street in Central. 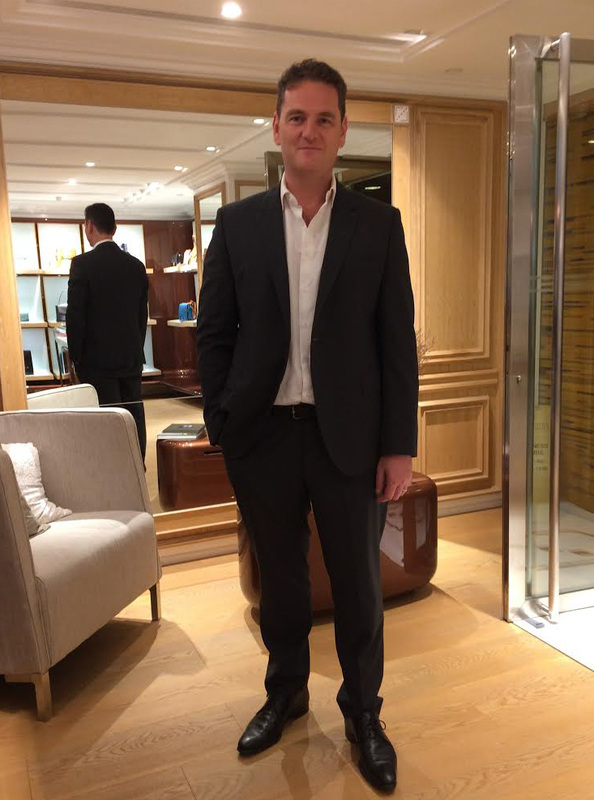 In the longer term, we plan to become established in New York and in Tokyo, maybe in two years when the brand will gain in notoriety, » expects Olivier Dauchez. As a matter of fact, this bet has all the chances to be won. In the meantime, those who wish to live the D’Auchel experience should not wait. The prices are much more than reasonable compared with the quality and the offered services. Logically, these should be increased someday. In Hong Kong art auction rooms, it is often said that “art is priceless”. This adage may as well apply to the craftsmen of the leather goods, who undeniably are true artists. * “Compagnon du Tour de France” : French organization of craftsmen and artisans (dating from the Middle Ages). Their traditional, technical education includes taking a tour, the Tour de France, around France and doing apprenticeships with Masters.